Why Learn About Litter and Recycling? What happens to the items I recycle? Is recycling really worth the effort? Why should I attempt to reduce the amount of garbage I create? What are the waste reduction and recycling options available in the county? Really, how harmful is a piece of litter? By learning the facts, living a more environmentally responsible lifestyle is no longer a nuisance. With understanding, taking the time to disposal of waste correctly becomes part of everyday routine instead of an unnecessary chore. Westmoreland Cleanways’ educational programs are constantly being updated to ensure timeliness and relevance to the environmental challenges we face. To learn more about our educational programs or to schedule a presentation, call 724-879-4020 or email our Program Director. The following is a list of presentations designed with youth in mind. As the programs use hands-on learning to keep the students engaged and active learners, they are geared towards small groups and classrooms programs. Not all programs are appropriate for all ages, but most of them can be adapted to a variety of ages and learning environments. To learn more about our educational programs or to schedule a presentation, call 724-879-4020 or email our Program Director. Focusing on energy and natural resource conservation; students will play a Westmoreland Cleanways created board game that follows the stages of a plastic bottle’s life cycle, starting as oil and ending as a recycled product (hopefully). Learn the basics of composting and discover the connection between kitchen scraps/yard waste and developing healthier soil for plants. Working in groups, students will construct a three dimensional pie chard representing the Municipal Solid Waste discarded in the United States per year (garbage pizza). Using the pizza as a visual, students will analyze the chart to brainstorm waste reduction solutions. Interactive displays developed by Keep Pennsylvania Beautiful can be used as a stand-alone display or can be the focus of a presentation. Litter Board: Create litter awareness by matching a common litter item with its correct decomposition time. 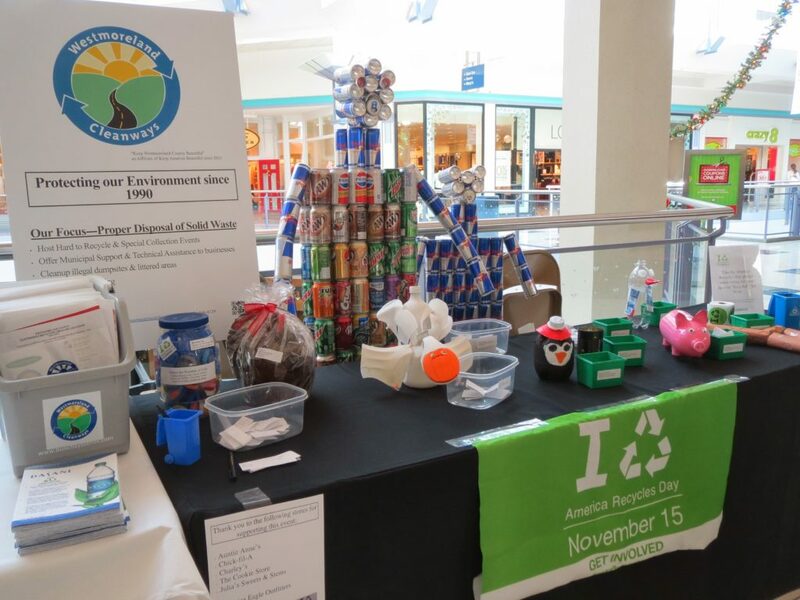 Recycle Board: Create recycling awareness by matching a common recyclable item with the new product it can be recycled into. What happens to your garbage after it is picked up by the garbage truck? What are the environmental impacts of landfills, and what structures are in place to limit that impact? Students will build miniature landfills of their own design and test their soundness. Introduces students to the negative environmental impacts of litter as well as simple techniques students can take to prevent litter. Biodegradable, compostable, recyclable, PET, HDPE, polystyrene, 1-7, plant-based; plastic terminology can be confusing. We will take a closer look at the science behind some of these terms and discuss how this relates to the recycling industry. Learn about the benefits of composting and the practice of composting kitchen scraps using redworms. Students will observe a functioning worm bin and have a chance to meet the worms living in it. Interested groups or classrooms can also “worm sit” the bin for up to a month. Become contestants on the Pyramid game show (younger generations won’t get the reference, but it’s fun for them all the same). Players attempt to guess a series of words or phrases based on descriptions given to them by their teammates. The game focuses on different recyclable material with discussions about recycling between each round. You will need the free program Adobe Reader to open PDF files on this page. Get Reader here. Copyright by Westmoreland Cleanways. All rights reserved. Site Design by Leonard Digital.